What then is fasting for, and when should we do it? In the Bible people always fast for a specific purpose, and fasting is always coupled with prayer. Therefore, you never find a person in the Scriptures fasting as a general spiritual discipline. There is always a reason for the fast. People in the Bible fasted when they wanted an answer to prayer. Furthermore, there is a strong connection in the Bible between fasting, mourning, and repentance. I will give two examples of this from the book of Samuel. In 1 Samuel 7, the people were oppressed by the Philistines and longed for deliverance. Samuel, now Judge of Israel, calls the people to put away their idols and repent of their sins so that Yahweh will deliver them. The people then respond to Samuel by obeying his word, and then in verse 6 we find that they fast and pray as a sign of repentance and also to ask Yahweh to deliver them, ” So they gathered at Mizpah and drew water and poured it out before the LORD and fasted on that day and said there, “We have sinned against the LORD.” And Samuel judged the people of Israel at Mizpah.” So the people fasted as a sign of repentance and the Lord delivered them from the Philistines. Example after example from the Scriptures can be brought forth in support of this general idea. What the biblical data shows us is that we fast when we are in a very serious situation. We fast when we are mourning and asking for deliverance. We fast when we are penitent. We fast as a physical manifestation of our urgency in crying out to God to hear and answer us in our time of need. The criticism of fasting in the Bible that we find from Jesus and the prophets is not that it is a bad practice, but the criticism is that it is not done in a sincere way. The Old Testament reading for Ash Wednesday in the Book of Common Prayer is Isaiah 58:1-12. In that text the fasting is performed in an outward but insincere way. The text continues that fasting must be coupled with acts of righteousness. It must be accompanied by true contrition. Outward acts alone are not enough, but they must flow from the inward condition of the heart. Given this, should a Christian undertake regular times of fasting, or should it be irregular and infrequent? Ask yourself: is the church called to sacrifice itself for the life of the world? Do we take seriously our call to die to self? Is it just when circumstances in my own life are bad that I should mourn and fast, or should I, we, the Church, fast and mourn on behalf of our broken, fallen world, asking for our God to deliver it from evil and for His Kingdom to come? Do we not see enough reasons around us to fast and mourn for the deliverance of our city? Our nation? Our world? Do we have our eyes open? Now my point in mentioning this is that twice in this account by Luke, in verse 6 and in verse 31, prayer is called a memorial, and it is clearly a memorial that reminds God. In the same way we can see fasting as intensified prayer and that fasting too is a kind of memorial, a sacrificial offering that ascends to the Lord and gets his attention. Now this may raise our hyper-calvinist hackles, but this is the way the Bible speaks. Therefore if prayer is a memorial and fasting is an intensified type of memorial prayer, then we can see why the church would want to enter into regular periods of prayer and fasting for the sake of the broken world around us. We are called as the church to take up our crosses, deny ourselves, and follow Jesus; follow Jesus into the wilderness; follow him as he gives his life for the life of the world. Lenten fasting is one small way in which we follow Christ by offering up our memorial before the face of God, asking him to act on our behalf. Dr. Timothy LeCroy is a Special Contributing Scholar to the Kuyperian Commentary and is the Pastor of Christ Our King Presbyterian Church in Columbia, MO. A final post is planned which will address abstinence, otherwise known as giving up things for Lent. This is a follow up post to The Origins of Lent. In my previous post I argued that a 40 day preparatory period leading up to Easter is a very ancient Christian practice, as old as the Nicene Creed or the first complete articulation of the New Testament canon (4th c.). I also argued that fasting has always been a part of the Christian Church’s preparation for Easter, going at least as far back as the early third century. To make this argument I referenced several primary sources, including one well respected Christian Father, St. Athanasius of Alexandria. The primary question that arises out of that post is, “What kind of fasting was involved in those early days?” and a consequent question is, “How should I fast during Lent?” This post is an attempt to begin to answer both of those questions. The short answer is that these early sources do not tell us much about exactly how the fast was kept. In his second festal letter of 330 AD, St. Athanasius’ does not give any directions as to what is to be fasted from or how the fast is to be kept, only that it be kept. The reason for this seems to be that there was a great deal of local control over the nature of the fast, and that it was up to the local pastor (bishop) to set the parameters according to his own cultural situation and pastoral wisdom. Thomas J. Talley, in his book The Origins of the Liturgical Year, presents evidence that early Lenten fasting practices varied widely. By this he means that there was variation both in the number of actual fast days (for there was never a continuous 40 day fast. Sundays were always exempted and Saturdays were also in most places) and in the manner of fasting. It seems clear that the most arduous form of fasting would be abstinence from all meat and dairy. Additionally, from the sixth century we find that monks were allowed to eat one meal a day during the fast. What this says about the laity and their practices is unclear, but it seems likely that their fast would have been less arduous. In addition there were periods of Lent were a less arduous fast was prescribed: some allowing for the eating of diary products and eggs for a portion of the fast. Talley concludes at the end of the book that though the bulk of our detail concerning Lenten fasting comes from monastic sources, the laity still participated in the observance of Lent in some way. For the laity, Lent was primarily about penitence, a season to especially be mindful of and to repent of one’s sins. What fasting the laity observed is not clear, though it seems, as I mentioned above, that it was locally prescribed by local pastors and bishops, and that it must have been less arduous than that which was prescribed for monks. Later in Church history Lenten practices become a bit clearer and more uniform. The practice that came into being was to take one meal a day during Lent, abstaining from meat, milk, and eggs (excluding Sundays). Yet how late this general practice came to be is not clear. As I mentioned above, most of the information we have is from monastic sources. Furthermore there were many local dispensations that kept the actual fasting from being so severe. Additionally, certain trades and people in certain conditions (ill, pregnant, young or old of age) were exempted. The fact of the matter is that with all the dispensations, Lenten fasting has always been something where a general ideal was applied to local and individual circumstances. So we return to our original question, “What kind of fast was instituted in the early Church?” The answer is that it was locally variable and individually applicable. Pastors worked with the laity to ensure that some appropriate form of fasting or abstinence was taking place. Monks performed the most arduous fasts, but the laity surely did not follow with the same rigor. This leads us, in closing, to the second question, which is, “How then should I fast?” The answer is that this is something best left up to individual pastors and churches to decide. Even in the Presbyterian tradition, the elders of the church have the authority to call a fast. The Westminster Confession of Faith 21-5 says that “solemn fastings,” are a part of the true religious worship of God. Furthermore, chapter 62 of the PCA’s Book of Church Order provides for individual churches, presbyteries, and the entire denomination to call for a fast. That chapter even allows for the church to keep a fast called for by civil authorities if the leaders of the church find it in keeping with the Christian faith. There is certainly nothing keeping any individual church or presbytery from calling a fast for Lent. It would be completely in accord with the constitution of our church. Persuade them to fast; to the end that we who are in Egypt should not become a laughing-stock, as the only people who do not fast, but take our pleasure in these days. We in Reformed circles are reticent to fast because we see it as a medieval catholic practice. Yet the historical sources show us that it is far more ancient. These same sources also show that local churches have always had the ability to set the parameters of the fast. Therefore, let us keep the fast in order that we may keep the feast! A third post in this series is planned that will address some common objections to Lenten fasting. Every year around this time several blog posts are trotted out for or against observing Lent and arguing for or against various Lenten practices. I believe these kinds of discussions are good and helpful, especially within the neighborhood of Christendom where I reside: the broader Reformed and post-Evangelical world. The reason is that we, if I may lump us together, have been recently rediscovering many of the older practices of the church. Along with that we are also trying to keep our Protestant and Reformed bona fides by discussing which ancient practices of the Church ought to be retained and the way in which we ought to retain them. Furthermore, while we can trace the observance of a 40 day lent to the mid 4th century, the setting aside of some time of preparation in advance of Easter is still at least one century more ancient. In several sources, including the Didascalia Apostolorum, The Apostolic Tradition, and a Festal Letter by Dionysius of Alexandria, we find that there was a one, two, or six day preparatory fast leading up to Easter, depending on the time and location. This, according to scholar Thomas J. Talley, places the practice of preparatory fasting as early as the first half of the third century (200-250 AD). It seems that this six day preparatory fast has become our modern Holy Week, and that by the 4th century this period was extended to 40 days to symbolize the fasts of Jesus, Moses, and Elijah. Sources: The Origins of the Liturgical Year, by Thomas J. Talley; The Second Festal Letter of Athanasius, accessed here; The 39th Festal Letter of Athanasius, accessed here; Athanasius’ April 340 letter to Serapion found in Les lettres festales de saint Athanase, edited by L. Lefort, pp 654-656. I like eating. Eating is glorious and it’s at the heart of the Christian life, so I think about it a lot. That being the case, I recently got to thinking about the historical practice of eating fish during Lent and about the possible rationale behind it. Aside from an apocryphal story about a corrupt pope who owned a fishing business, I didn’t find much to satisfy my Protestant curiosity. Still I came to the ultimate conclusion that regardless of one’s particular Lenten practices, we could afford to eat more fish during the season. Let me tell you why. Some arms of the Church, Romans in particular, have a longstanding tradition of observing the Fridays in Lent as days of particular penance, marked by abstinence from the eating of meat. Historically, fish has served as a popular meat substitute on these days, distinguished from other prohibited meats because the fish is a cold-blooded creature (Lev. 7:26 seems to back this up). Excepting a sometimes-but-seldom-invoked acronymic relationship between the Greek word for fish—ἰχθύς—and the name of Jesus—Iesous Christos, Theou Yios, Sotor—the choice of fish, in practice, is mostly arbitrary or pragmatic (it is filling and satisfying like meat). But there better, deeper-rooted reasons to make fish a part of our Lenten diet. In Scripture, the seas and waters under the earth are commonly a symbol of the gentile nations, and likewise the fish dwelling in them. The rulers of Tyre are called “the princes of the sea” (Ez.26:16), Nebuchadnezzar is pictured as a great sea monster (Jer. 51:34), the nation of Egypt is called a nation of fish and river-dwellers (Ez. 29:4). (for more on this, see Through New Eyes or pretty much anything else Jim Jordan has ever written…ever…probably even his grocery lists). In contrast, Israel is seen as a people of the land, and in the Old Testament the prominent men of God are farmers and keepers of livestock, not fisherman. That changes when Jesus comes calling fishermen into his service. With me so far? Okay, here’s where the ride speeds up. The forty days of Lent are taken from the forty-day period our Lord spent in the Wilderness after his baptism, which in turn shares a typological relationship with other ”forty” periods in Israel’s (or protoIsrael’s) history—most notably the forty days on the ark after Noah’s flood and the forty years of exile after crossing the Red Sea. These earlier events culminated in further separation from and/or victory over the gentile “nations.” Jesus’ forty days, however, orient Israel in the opposite direction. He comes out of the Wilderness and departs immediately to Galilee of the Gentiles, the first order of business being to recruit experienced fish-catchers. Unlike the conquest of Canaan, Jesus doesn’t slay gentiles and drive them away, but begins drawing them to himself by the net-full. In fact, after Jesus’ forty days of fasting, the first food mentioned in each of the synoptic gospels is fish. While the first Joshua supplanted the nations and took possession of their land and their vineyards, the final and greater Joshua desires to possess the nations themselves—fish is the sign of the gentile peoples being incorporated into the body of Christ. Throughout the gospels, fish is one of the few foods explicitly named as something Jesus ate, and he is always feeding it to his disciples. Alongside bread it is the food given to the multitudes in all the gospel accounts of miraculous feedings. Jesus not only tells Israel to embrace the nations (to love her enemies and be a light shining before all nations), he has them practicing it through meals of fish. Finally, the Lord’s “feed my sheep” admonition to Peter in Jn. 21 follows immediately on the heels of his preparing a breakfast of fish for his disciples and bidding them “come and eat,” a possible sign that the life and health of the Church will be bound up with the pursuit and inclusion of the gentile nations. *Unless you’re eating fish sticks, which should only be served to children (as punishment for being picky) or to convicts (as punishment for being convicts). Collin Hansen wrote an article for the Gospel Coalition entitled Should You Cancel Good Friday? which has brought to the attention of many a conversation they have never had before. What is Lent? Why celebrate it? As a committed Protestant, I am committed to the Church Calendar, not because I want to be a slave to it, but because I am aware of its inevitability. We all follow some calendar. The question is which calendar? I ask that question because Protestantism is grounded in a Trinitarian view of the world. In its best expression it does not isolate ideas; it brings ideas together to form a coherent system. I suggest that Lent is highly Trinitarian. As the Trinity is a communion of love, so Lent provides a means to express that love to one another in the community. Where sins are confronted and battled, there you find a vigorous Trinitarian community and vision. Lent is service to the community by giving us a season of determined battle against sin for the sake of our neighbors. It offers a vision of history that undergirds the biblical history and that reflects the normal routines, liturgies, and rituals of human beings. Lent is a form of restructuring our lives. All Christians need a re-structuring of order in their own lives. All Christians need to re-balance and re-form areas where there is disproportionate indifference. We all undergo a Psalmic journey of lamentation and feasting. Lent draws us into this journey. In essence, Lent reveals the God who suffers in the Person of Jesus Christ. God’s image-bearers are formed from the dust of a fallen Adam to the glorification of the risen Final Adam. To disconnect Lent from the Church Calendar is to disparage history. It is true we live in the age of an ascended Lord, but this same Lord guides a Church that is still broken, suffering, and healing from brokenness and suffering again and again. The removal of Lent is to proclaim an over-realized eschatology. It is true that Lent can be abused, and history teaches us that it has. But it is also true, as Luther so memorably stated, “the abuse of something is not an argument against its proper use.” So if Lent can be proven to be profitable, then is there a legitimate way to benefit from it without falling into some its former abuses. Protestant Christians are not bound by Romish structures of food or rituals. We use wisdom in forming healthy habits for a Church and individuals while not binding the Church or the individual to a particular habit. Lent teaches us that Satan’s gifts are easy to master. They come with first grade instruction manuals. They are made to be mastered quickly and enjoyed rapidly (fornication, drugs, alcohol; various temptations). God’s gifts are a little harder to master. They require self-control and patience. They anticipate spiritual growth; they demand a kingly attitude to grasp kingly wisdom. God’s instructions mean you have to seek others in the community to understand them properly. You have to exercise and express a theology of patience built into a theology of blessings. In the wilderness, a garden stripped of colors, fruit, and water, Jesus faced the devil again in a re-match. He knew well that temptation had a triumphant history of subtly winning arguments. Jesus wasted no time and rebuked temptation. just like He would do with the demons and the demonic-like religious teachers of the day. We are not to sit in temptation’s classroom. God already said we are to flee it; to rebuke it with the only source of authority that is permanent and stamped with divine truth. The Church finds herself in a wilderness scenario. She is stripped of her former glory. But she is destined to journey from glory to glory like her Lord and Master. As in Luke four, we need to sit in Yahweh’s school house. We need to be instructed by the two-edged sword that muzzles the Tempter and tells him to not come back again. He is not welcome and neither are his offers. Lent offers us a 40 day class on temptations and the glories and rewards of resisting it. 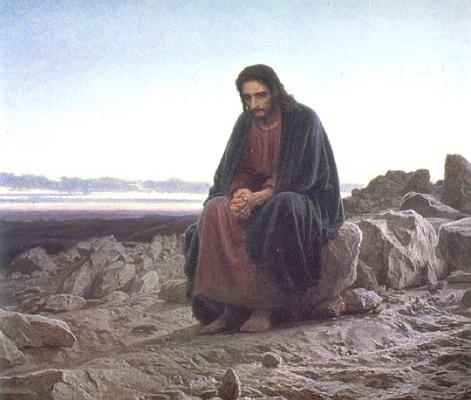 Lent follows the temptations of Jesus in the wilderness. His fasting for 40 days speaks to the evil and the hardness of heart of the Israelites who succumbed to the Serpent’s whispers. So as the Church walks with Jesus from wilderness to Golgotha she re-lives the messianic journey. The 40 days are symbolic for that wilderness testing, and as a result it is chronologically set before the Great Paschal Feast, commonly referred to as Easter. Ligon Duncan and others in the Southern Presbyterian tradition argue that Lent has a meritorious history. Lent was a way to earn something. The Reformation fixed this soteriological error, and therefore Lent is no longer to be observed. Duncan and others also go on to say that celebrating Easter and Christmas offer no such harm (he also believes that a National Holiday like Thanksgiving is also a uniquely American holiday to be celebrated). There is no doubt Easter and Christmas, and even Thanksgiving–to a lesser degree–offer wonderful benefits. But the question and the opening presupposition is that Lent is not biblical therefore it should not be practiced in the Church. If that is the case, then the question is not whether one day (or Season) is more beneficial than the other, but rather is it explicitly stated in the Bible or not? If the “explicit reference” argument is used, then Duncan will have to conclude that this is faulty reasoning. The biggest threat to Christianity today is not the church in Rome, or that Americans are prone to elevate traditional Christian rituals, like Lent, over discipleship. The biggest threat to the church is that our rituals are increasingly only secular ones. We are Americans before we are Christians. Super Bowl Sunday not only competes with the Lord’s Day, it dominants it. And when we relegate the Christian life to a mere facet of our American lives we fall into Moral Therapeutic Deism. The formation of godly habits is the issue at hand. In other words, is there an adequate time of the year where the Church should have an explicit focus on the cross of Jesus and how that cross must shape our understanding of sin? Is there room for setting aside a season for a cruciform hermeneutic? I believe there is. Lent is a season for taking stock and cleaning house, a time of self-examination, confession and repentance. But we need to remind ourselves constantly what true repentance looks like. “Giving up” something for Lent is fine, but you keep Lent best by making war on all the evil habits and sinful desires that prevent you from running the race with patience. If this is true, then Lent serves an enormously important role in the life of the Christian. Naturally, to quote Luther’s first thesis, “the Christian life is a life of daily repentance.” A faithful understanding of the Lord’s Service provides that for us weekly. However, an extended period where our sins are deeply brought to our attention by the preaching of the Word and prayer (and fasting) are regularly considered, practiced and meditated upon can provide great benefits for all Christians on each Lord’s Day and throughout the week. The legalism concern is legitimate. We are all tempted to fall into this trap, but it does not have to be so. If we view Lent as a time to additionally focus our attention on mortifying our sins and killing those habits that so easily entangle us, we can then consider the cross in light of the resurrection, not apart from it. If we do so, Lent will become legalism’s greatest enemy and repentance’s best friend. Giving Up Me for Lent? Lent approaches (Wednesday, the 13th for those who aren’t following along) and many–but certainly not all–Christians will be deciding what to give up. N.T. Wright, in one of his many good books on the Christian life (Simply Christian, maybe) mentions that Lent is a season of death, therefore we give up something. Easter follows as a season of new life and new creation, so we should take up something–something new and good. It is not my intention to come across as smug, overly pious, or prideful–but I realize that what I am about to say is all of those things and contradicts the very thing I am intending to do–yet I hope to give readers something to consider for their own Lenten practices this year. A friend recently shared Andrew Murray’s Humility with me. Then, I re-read C.S. Lewis’s Mere Christianity. Then, my pastor preached on humility and pride. Then, well you get the idea. Each of these books or sermons deals directly with humility and pride. It may just be that God is trying to tell me something. Thus, I’ve decided to give up myself for Lent. I don’t know if this is a legitimate thing to fast from during Lent–historically anyway–but it is my plan. From Ash Wednesday to Easter, I am giving up myself. I will strive to not tell any stories about myself, not to “out-do” anyone else. Just listen. Just ask questions about them. Just be interested in them. Just care about who they are. I’m not going to tell people how great I am, and I’m not going to tell people how despicable I am–both are cases of pride, although we often try to convince ourselves the latter is humility when it is not. Whatever your view of Lent is, whatever your view of fasting is, I’m sure you agree that pride is a great evil for Christians and humility is a great weakness for many. Pray for me, that the Lord would have mercy. That I might give up myself for Lent. I’d rather hope that I can ask this question without it turning into a competition to out-holy one another. So, if you are practicing Lent this year, what are you giving up? 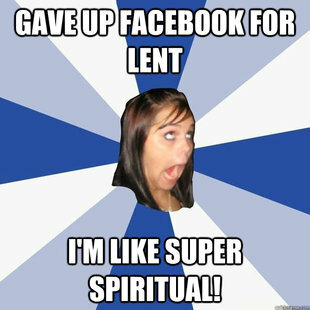 Everyone will soon be sharing what they will “give up” for this Lenten season. And whether you’re Roman Catholic, Methodist, Presbyterian, Anglican, or Lutheran, it is easy to predict that most people will choose silly things to “give up”. Christianity Today posts a list from Twitter of the top 100 Lenten sacrifices, I’ll post the top ten here to show what I mean. These are great examples of what NOT to give up for Lent. Lent is not a 40 day long New Years resolution, yet this is what “fasts” like these above make it out to be. Like all the Church Calendar, Lent is modeled after the ministry of Christ. Forty days, in commemoration of the forty days Jesus spent fasting in the desert, enduring temptation by Satan before the beginning of his public ministry. I know that traditionally, Christians have “given up” something for Lent and usually that “something” has been something they particularly enjoy. This may be seen as a form of “fasting” I guess, but if it is, it’s a very pale shadow of what “fast” (doing without food of any kind) really means. I understand the rationale for the practice, but given it’s very limited focus, it seems to me to miss the point of fasting in general and is easily metamorphosed into something like a “Pharisaical” act (i.e. “God surely must be pleased with me since He sees me foregoing my usual afternoon grande chocolate-caramel-cinnamon mocha latte with extra foam, which I’m absolutely dying to have right now!”). The heart of Christian reality is a society – a trinity- of persons living with and for one another. Our Lenten sacrifices should remind us of how we have sinned against the Triune God, and our neighbor-not serve as some superficial monastic flagellation. As we develop our Lenten sacrifices we should move away from petty moralism and understand that as a Reformed Protestant, Lent is going to look much different for us than for the Roman Catholics. The early protestants were accused by the Roman Catholics of having a faith that was, “too glad to be true,” as C.S. Lewis once said. The Bible tells us that Jesus, “for the joy set before Him endured the cross” (Heb. 12:2). If the gruesome cross was a joy, what does that say about his fast in the wilderness? All of Christian living is joyous, not morbid. Fasting and somberness in themselves do not contribute to holiness, and the council of Nicaea even forbade fasting on the Lord’s day. Go, eat your bread with joy, and drink your wine with a merry heart. Permission to reprint in whole or in part is gladly granted, provided full credit and a link is given.